Ready to jump in, Sew-Alongers? We're going to start by making a muslin of the bodice only. Have you decided what size to make? If you're between sizes, I would suggest going up rather than down. This bodice only has two inches of ease, which is fairly close-fitting. If your measurements are smaller than the size 0, start with a 0 and we'll fit from there. 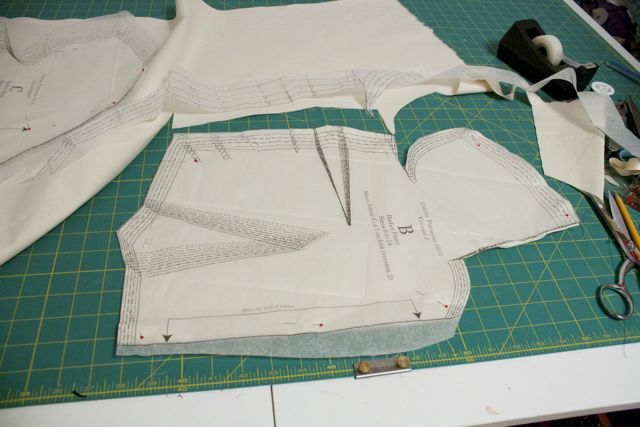 Get out your pattern tissue and find piece B (bodice piece version 2) and piece C (bodice back). Cut roughly around the pieces. 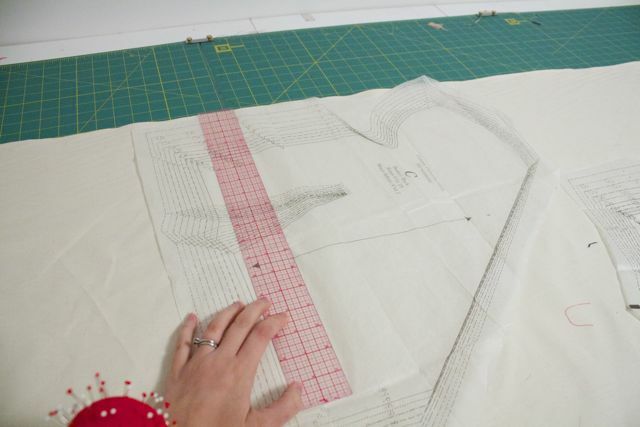 I wait to cut around my size lines until the pattern pieces are placed on the fabric. 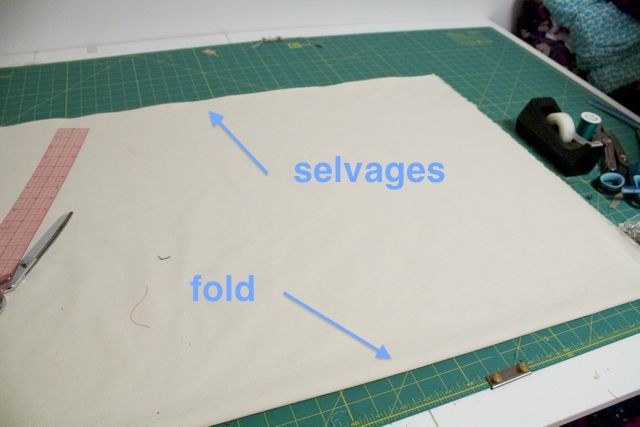 Lay out your muslin, doubled up selvage-to-selvage. Next, place the pieces on your muslin. Piece B will be cut on the fold. Match the center line up with the muslin's fold and pin. Next, lay out Piece C on your fabric. It is not placed on a fold, so you have to make sure the grain is straight. The arrow mark in the middle of the pattern piece marks the grainline. You must make sure that this arrow is parallel with your selvages. I like to pin one end of the arrow, measure the distance from the selvage, and then pivot the other end of the arrow so that it's the same distance from the selvage as the other end. Make sense? Now, on to marking. 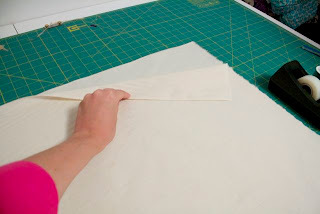 Slip some tracing paper under the tissue, sandwiching your muslin pieces between two pieces of tracing paper. Also trace dots and circles. I like to use the point of a large knitting needle to "color" in the circles. Don't forget to snip your notches! Here are the pieces, all marked and snipped. 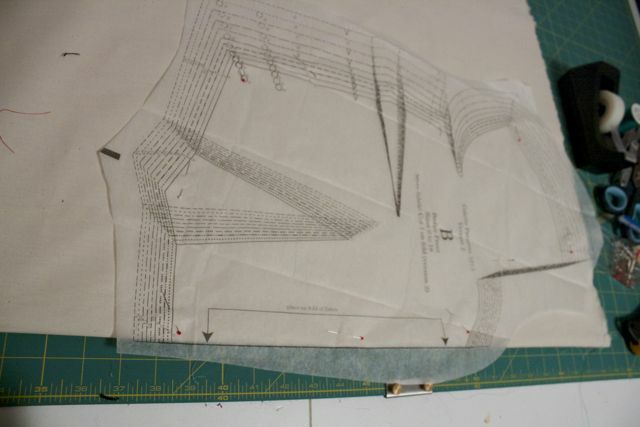 Next I'm going to have you thread-trace the seamlines on your pieces. 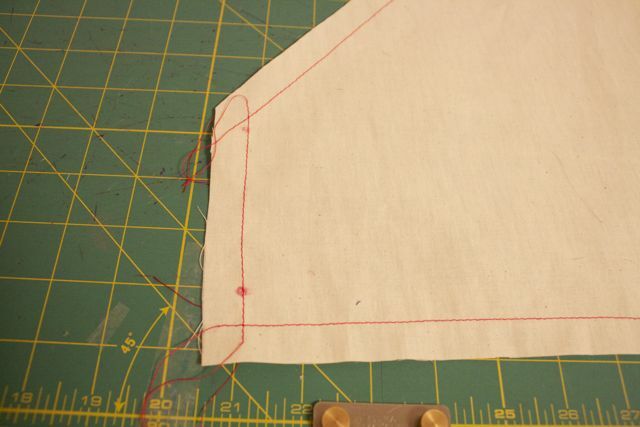 I do this for a couple reasons: 1) the thread tracing functions as staystitching, preventing your muslin from stretching out of shape while you're working with it, and 2) it's very helpful to see from both sides where your seamlines will be. For instance, you can get a much clearer idea of what the neckline will look like with the seamline traced, rather than with the seam allowance attached and no markings. Everyone on board with the thread tracing? Simply take your pieces to your sewing machine, and using a medium-length stitch (around 3 mm), sew 5/8" from the raw edges on all sides of your pattern pieces. Break the thread at the end of each line of stitching; do not pivot around the corners. Use a dark or brightly colored thread that shows up well on your muslin. I think that's enough for today. Next time: basting your darts, basting your muslin together, and your first fitting! Just wondering, do you have a button for us to use on our blogs? This is my first sew-along and I am super excited. Thanks so much for running it! Just a question about the tracing paper you mention. 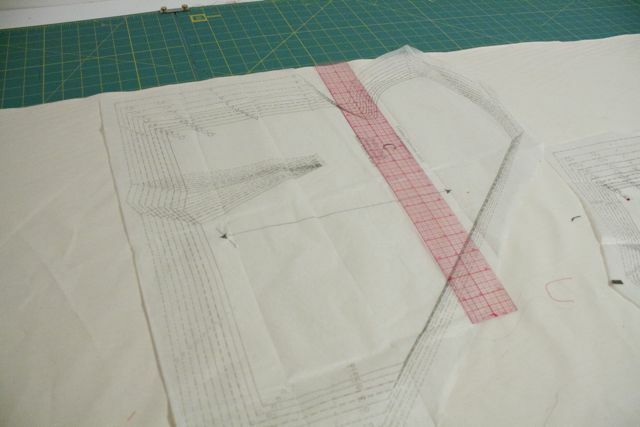 Is this a special type of tracing paper for transfering pattern markings? If so, can you pls tell me what it is called and where I can buy it? I signed up for the Lady Grey sew along and have decided that it is too big of a project for me. 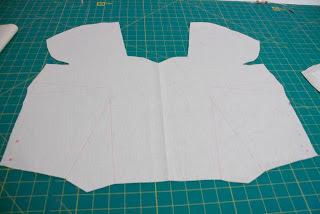 Instead, I am now doing a simple jacket and using some of the tailoring techniques from the sew along. I had purchased the supplies you mentioned on your blog for the Lady Grey coat including 1/4" stay tape. When I look at your tutorial for applying the roll line stay tape, you indicated that the tape is 3/8" wide which is the width given in the Classic Guide to Sewing the Perfect Jacket Tailoring. I am just mentioning this as I'm sure many people will continue to use your excellent blog series on tailoring and it may be possible to make some note in the supplies regarding the stay tape width needing to be 3/8" wide. It's my first sew along too - really excited! I am a size 12 in the bust area but a size 16 in the waist area (2 kids in 3 years, yes I'm very tired!!). 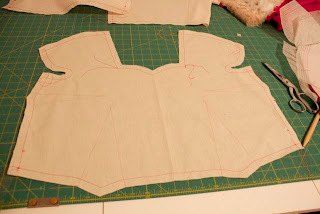 I've drawn a sloping line at the side seam from the notch (size 12 line) to the bottom of the bodice (size 16 line). However, I haven't got a clue what to do about the darts - do I take the 12 or 16 or do I do the same thing and do a sort of joining line between? Many thanks for any help you can give! 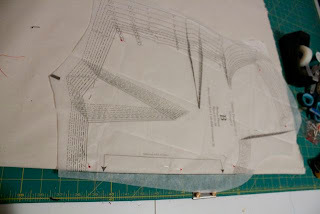 BookishFraulein, I listed and linked to dressmaker's tracing paper in my supplies post. The stuff I use is a bit bigger, but the smaller (and more readily available) Clover or Dritz paper works great. Karen, I would start with your FBA, since an FBA adds both length and width. That might be all you need. I'm going to try to do an FBA post, but . . . things are a little crazy right now. Fay, I would fold up the underarm dart and draw a line from the size 12 *at the armpit* down to a 16 at the waist. This will give you a more subtle line than transitioning from the notch down. I'm trying to join for this sew-along (it's not easy to find all the notions I want here in France) and I want to thank you for doing such a wonderful blog. I have a question : I know I will need to do a FBA (I'm a french E cup, which I think is an american DD cup). Do you think I should do a muslin first (and "waste" some fabric) or try to adjust the pattern before? Hi Litchi, how does your bust measurement compare to the bust "finished measurement" (on the envelope back, at the bottom)? This will tell you if you'll need extra inches. Colette Patterns are cut generously in the bust, so you may not need an FBA. 1)Some people may want to trace the pattern onto paper first. It preserves the pattern, and pattern- or kraft paper is easier to handle than tissue paper. 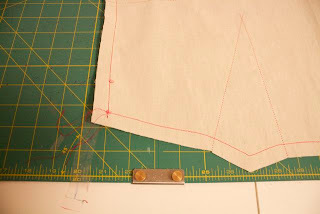 2) Block the muslin, i.e., check that the vertical and horizontal threads are at 90-degree angles to each other. You can Google the instructions. 3) I thought that "thread tracing" was a basting stitch without knots done by hand. I guess it can be done by machine, but it has to be perfect, otherwise it won't be helpful. I would do it by hand myself. It doesn't take that long, and it's good hand sewing practice. Usually, the thread tracing is done with a colored thread and a sequence of stitches, for example, one long, on short, so that the right side of the fabric looks different from the wrong side. With real fabric that can be very important. 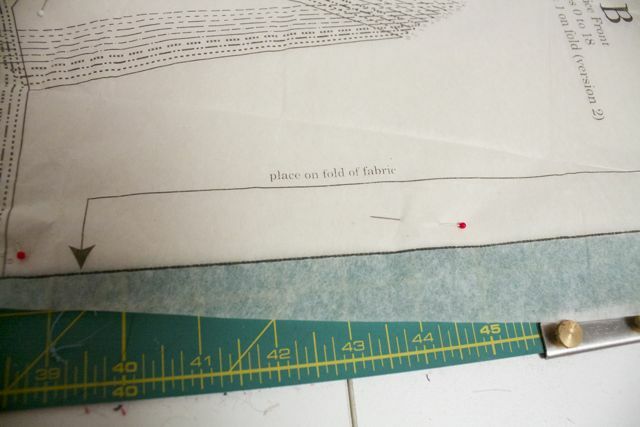 You also usually don't want thread tracing to be confused with regular basting or stay stitching, the latter of which I thought was done within the seam allowance. 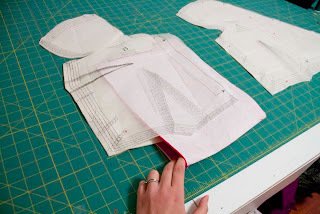 Stay stitching is done in the seam allowances on the actual fashion fabric. But happily, this thread tracing doubles as stay stitching on the muslin. Many thanks for the tip to take it from the armpit - will do. My other question is what to do with the dart that sits on the waistline - should that be taken in a 12 or a 16 or do I just work it out at muslin stage? Sorry for the numerous questions! Ah, I see what you mean, Fay. 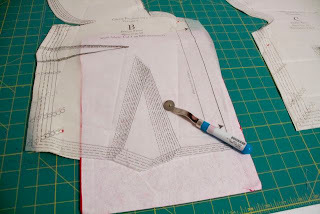 I think the best thing to do would be to start tracing the dart at a size 16 at the waist, and then transition up to the 12 at the top of the dart. (where it hits the bust) That way, it will mimic what you've done with the trasition on the pattern. Well, Gertie, I had a real 'duh' moment when I read the bit about using the transfer paper for transferring marks. I hate transferring marks because I never feel I'm accurate. I have dressmakers transfer paper. Why didn't I think to use it? So I feel like an idiot, but thank you so much for pointing this out! Hi Gertie and fellow sew-alongers! This is my very first Colette pattern (and very first dressmaking attempt)! I'm a 32D, so I'm rather narrow around the shoulders/back, but I need fullness for my bust. I'm 32" around the waist, 39" around the hips. Do I measure from high bust, like for other Big 4 pattern companies and do an FBA, or do I just measure around the bust? I know Colette runs bigger in the cup. Thanks! Just thought I'd chime in on Fay's question since I do this move on my own garments often -- one thing that you can do if you need more room at the waist but are smaller up top is just stitch a smaller vertical dart, rather than grading all the way out to a 16 at the side seams. 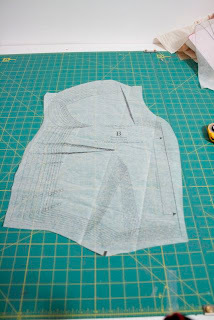 Figure out how much extra room you need at the waist, and then just make the darts more narrow to give you extra space. Sometimes I just sew a pintuck where the dart should be if I need lots of extra waist room but want to have the look of a dart. kasza02 (and everyone else), make sure to check the "finished bust measurements" at the bottom of the envelope back. This will tell you whether you need to add extra inches through an FBA or not. I know some D cups don't need an FBA with Colette, so don't assume that you do. Tami, did you check the finished garment measurements? It will only be easy to take out if you leave wide enough seam allowances to do so. Thanks so much for your quick responses and patience, Gertie! 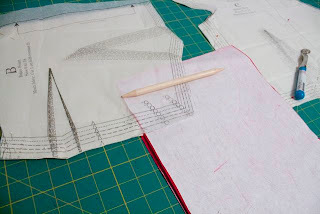 And thank you for hosting this sew-along for those of us who are delving into the deeper waters of sewing beginnerhood! I know I'll learn so much over these next few weeks. I was wondering about a small bust adjustment if a person is about a b cup. 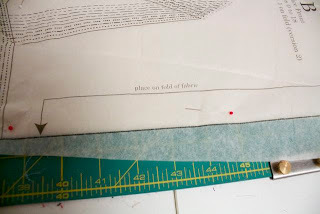 Should I just narrow the horizontal dart and then take the same amount of length off the bottom of the pattern as one of my fitting books tells me to do? Or is there another way to do this? natasha, are you positive you'll need an SBA? I like to wait until my muslin is made to be sure. The nice thing about SBAs is that you can just take out vertical and horizontal tucks in your muslin. I like to take a horizontal one across the bust, and another one that goes down where the princess line would be. That's how I do it, anyway. I wouldn't just take length off the bottom of the pattern piece. 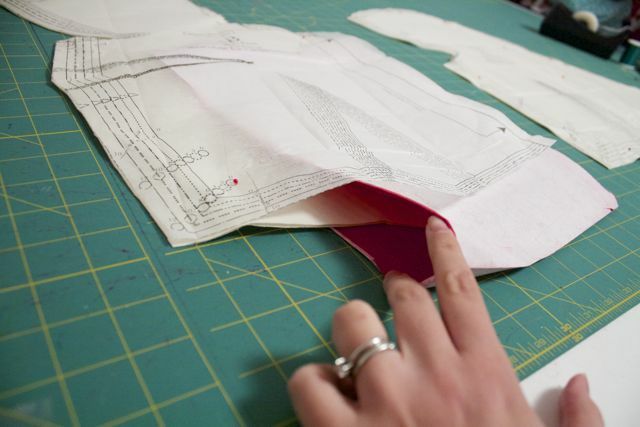 One of the best fitting rules I've learned is that you should concentrate your alterations where the fitting problem is. I.e., don't make changes at the waistline to fit the bust. I'm sure some would disagree though! I'd like advice on SBA too please...I wear a C cup but narrow backed so coming up as a size 2 according to back of pattern ;-( Size 10 elsewhere. Thanks Gerties I'm getting my sewing mojo back after 5 years and 2 babies. 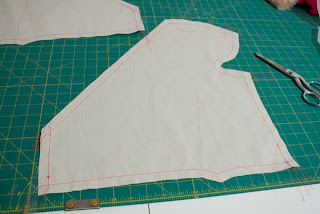 I am nervous about the bust fitting factor, but I just went ahead and cut out the muslin as per my bust measurement. 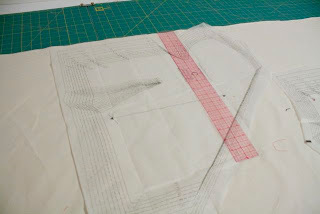 Since I feel that I may end up needing to refer to a different size, I traced my pattern onto some tracing paper first. I am looking forward to the fitting stages. Thanks Gertie! I think the idea is that, when you narrow the horizontal dart, then you have extra length at the bottom that needs to come out? I jumped the gun a bit as I have such limited sewing time and really wanted a christmas dress, and I made up a muslin in a size 6. It fit really baggy in the bust, and I was thinking just going down a size wouldn't be much help. Camilla, I'm not sure I understand. Is your actual bust measurement equivalent to a size 2 or your high bust measurement? If you wouldn't mind posting both your high bust and bust, that would be helpful. Thanks! Thanks Gertie - high bust: 33. Bust: 34. Waist 29.5. Hips 40. Am loathe to cut the smaller bodice size as if its anything like buying tops, then the armholes and shoulders will be too small. Really appreciate your advice. 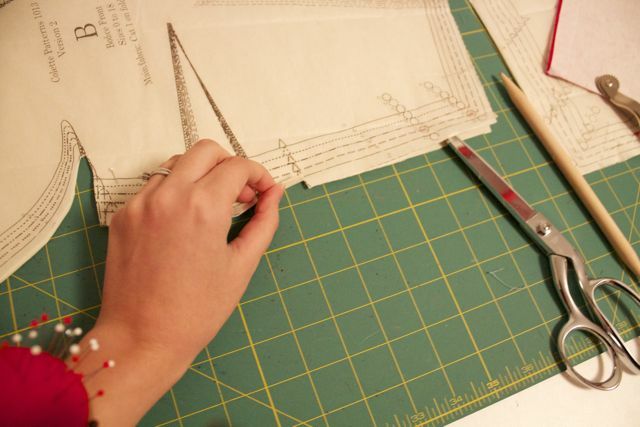 I wait to cut around my size lines until the pattern pieces are placed on the fabric. I often think this would be easier--but doesn't it dull your scissors? 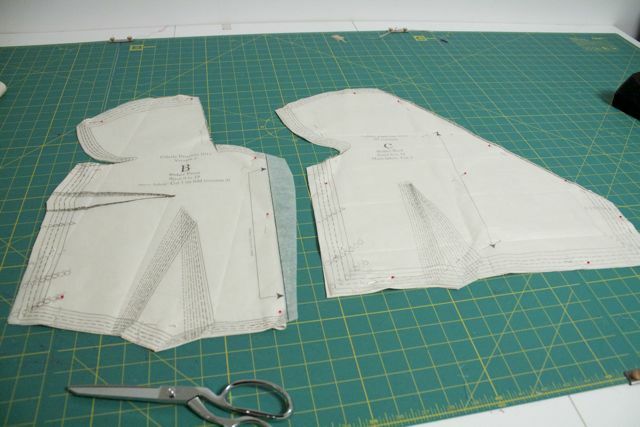 Although, considering I hate cutting out patterns, it's probably worth it. Love that your kittie is helping out early on. My pattern haasn't arrived yet - cry. Hopefully it won't be too long and I won't get too behind. I am a full 2 inches longer in the waist than the pattern and I don't know at what stage and how I should make the alteration. so excited to get started. 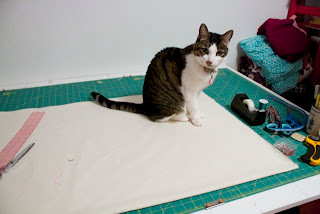 Well, I've got the pattern, I've got my fashion fabric BUT: NO musslin to make a toile. It's shipped but seems to be going via the North Pole. And all old bedsheets are jersey. Another day, another delivery chance. Thanks a lot Gertie, for this sew-along!! Camilla, why not find a happy medium and start with a 6 in the shoulders? And then transition down to an 8 at the waist, 10 at the hips. I would definitely trace your bodice pattern in case you need to refer back to other sizes. lesley, did you find this out by tissue-fitting or measuring? 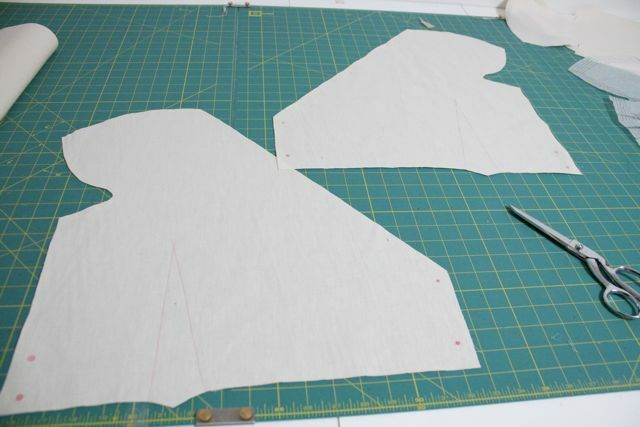 If you're positive the bodice is going to be too short, you can slash and spread about mid way up the bodice. Just draw a horizontal line, cut it, spread 2 inches and tape to new tissue paper underneath. You'll need to redraw the legs of your darts. daiyami, I don't worry about tissue paper on the scissors since it's so thin. I don't have a problem with it. Miss P, I can definitely do some photos since it sounds like people are a little confused about transitioning between sizes. I'm a little too sick to do it right now :(. Hang in there, I'll try to get to it this week. I would also like to know about us "long waisted" folks. I'm a beginner, but my mom used to always add an inch or so to the pattern. I'm also small busted...so any tips will be welcome. I haven't cut it out yet, doing a ton of other stuff but will do it this week! And, get better, ok?! Thank you for doing this. Thanks, Gertie! Hope you feel better soon. So, I've sewn up my muslin - I used swedish tracing paper. I'm quite impressed that the bust and waist fit nicely, but my problem is that I tore the arm holes/back of shoulder area in the trying on of the muslin. Obviously they're too small, but I'm not sure how to adjust them, given their funny shape. Anyone got any ideas/advice? Gah!!!! my pattern still hasn't arrived (it shipped on 16th November, I guess Australia is on the other side of the world and all). You won't be taking any of this down any time soon will you, Gertie? Gertie, thank you so much for answering everyone's questions! Your responses about bust fitting have been so great I was able to figure it out on my own (I hope, hee hee). A family emergency has left me behind, but I should be able to catch up with no problem. Thank you! I just got my pattern today YAY. But, I'm having the same issue is Camilla. I'm a size 12 in the bust, 14 in the waist and 18 in the hips. Should I cut each section in the size that fits and blend them together? Thanks so much Gertie! I'm so happy to have you leading us through this!! Question: I suppose the muslin isn't supposed to 'pucker' as I am sewing it, correct? What would cause this to happen? I am walking away from it until I can find the answer!!!! Oh how frustrating for a beginner sewer: I get to the last step, and the stitches start to pucker the fabric, etc. I think I'm having tension problems yet again. *sigh* Any tips? I'm using a borrowed machine and have already been through complicated tension (and other maintenance) issues with this a month or two ago. Thank you Gertie! After years of the 'lash it together and hope it holds together' type sewing, I'm doing proper things like marking, basting, muslins & stuff!! !